Modern Debt Jubilee: Ann Pettifor as Imagine2027. 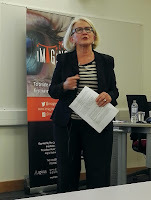 I went to see Ann Pettifor speak last night. She was speaking as part of a series called Imagine 2027, organised by The Cambridge Commons and Labour History Research Unit of Anglia-Ruskin (the other university in Cambridge). The idea is that speakers will set forth what needs to happen over the next ten years for positive social change. I've read many of Ann's articles and watched videos of her speaking, so I had some idea of what to expect. And she was everything I expected. I thoroughly enjoyed the talk and her answers to the questions. The Q&A went on for about an hour. The event was videotaped so hopefully it will appear online at some point. The finance system should serve the real economy. Ann spoke a lot about how most money is created by credit, by borrowing. When the government found £1,000 billion to bail out the finance system in 2008/9 it did not suddenly strike oil or gold and get rich. It simply entered the number in a computer and transferred it to the banks. The banks had to put up collateral and in some cases the government took ownership of the bank for a time, but the £1000 billion came into existence in an instant. The phrase "magic money tree" was not mentioned, but it might well have been, because all money these days is like this - we create more money by borrowing from banks. When we buy something on the credit card we create money. And so on. A central bank, which in the UK is quasi-independent, but in fact publicly owned which manages interest rates and provides reserves and guarantees for private banks. A criminal justice system capable of enforcing contracts. In the UK a branch of government. A banking system to facilitate the transfers of money. If we look at this we see that money is dependent on the state. And furthermore it is ultimately dependent on tax-payers, who support the currency by paying their taxes in that currency. If we paid our taxes in US dollars, the UK Pound would cease to exist. As we have seen in the last decade the private finance sector is actually a liability to this system. We spent £1000 billion bailing out the big banks to preserve the banking system after they recklessly destroyed vast amounts of wealth. Also we have to guarantee savings, because banks are unreliable these days. So finance is a liability. Finance makes a lot of money day to day, but as it is presently run is inherently destabilising and has cost us all dearly. Someone asked the obvious question about the private "crypto-currencies", such as Bitcoin. To which Ann stated, quite firmly that she believed them to be "Ponzi schemes" and "scams". They are based on the same monetarist theory that has been so disastrous in other areas. So expect no help from that direction. We lost control over our monetary system to the private finance sector ca. 1971. Ann emphasises the stability of the post-war economy (1945-1970) and the lack of recessions during that time, and though she didn't mention it, the vast sums we owed to the US to pay for the war. In 1945 government debt was 250% of GDP and this was addressed by expanding GDP massively by investing in infrastructure (hospitals, roads, schools, universities, etc). I think she simplified this period considerably. For example, the inherent instability of the US gold standard helped to undermine the system when the US started fighting an obscenely expensive war in Vietnam and needed more money, but could not create it (and were impeded by the French buying up gold at the same time). So it wasn't a perfect world and the system was ready to fall when it did. Simply recreating that system would be doomed. But there were real advantages that we could incorporate into what we do now. The bottom line was that we want finance to serve the real economy. A major policy discussed was the control of capital flows across borders. And a question brought out how we might do this. We could impose a so-called Robin Hood Tax on large sums of capital being transferred out of the UK. So that when some large multinational was moving vast sums out of the UK to avoid paying tax on them, there would be a small tax on that transaction. Another was the issue of sovereign debt, but at this point I became lost. I was not clear what point Ann was making, other than that she considered sovereign debt good. Something to do with how it impacted the money supply. The last point, and perhaps the most important, is that we need to focus investment on employment. If we invest in employment then we create a number of virtuous loops. The employed person is productive and less reliant on the state. They pay taxes to fund government spending. They also spend their money and this creates profits for retail and drives production. Above all we need well paid employees spending their wages in the (real) UK economy. That is what happened after WWII. Full employment, good wages, low crime, and strong economic growth. Of course endless economic growth is a myth and a problem that was not discussed. But, for example, imagine if, having nationalised Royal Bank of Scotland, they were directed by their new owners (us!) to invest in green energy and jobs for Scottish people? Instead they continued to invest mainly in derivatives and other areas of the economy that produce nothing and create no jobs (except for a handful of bankers). So no benefit has accrued as a result, except that the share-holders of RBS have got their dividends. And they're probably not even paying tax on it. Here's another idea that just occurred to me - all shareholder dividends of UK companies should be taxed at source, like PAYE (and yes, taxed twice if they go offshore). Ann's personal revolution was the Jubilee 2000 Campaign which she directed. It resulted in world governments cancelling £100 billion in debt to poor African nations that could not afford to pay the interest, let alone the principle. However, while her ideas are revolutionary, she clearly doesn't see herself in a leadership role. She is an educator and adviser, but her call is for us to educate ourselves and for us to organise ourselves, not to follow her. And one cannot help but be a little disappointed by this. Movements require leaders and organisation. In Malcolm Gladwell's terms, a revolution requires connectors and persuaders and ideally someone at the head who is both. Someone who articulates a vision, has a practical program to achieve it, and who provides the focus for organising the mass demonstrations required. Not an easy role, I imagine, but a necessary one I think. When our political leaders are so very disappointing (venial, dishonest, ideologically driven, parochial, self-serving, etc etc) we might well look outside the mainstream of politics for leadership. Ann is just as charismatic in person as I had expected her to be, and is someone I'd happily get behind if she ran for office (I struggle to think who else I might say this of). Of course I have long been a convert to these kinds of revolutionary ideas in their broad outline, so I am biased. However, I ran into an old acquaintance outside the lecture hall and we were both bothered by the lack of an obvious movement to get behind. Some years past, in a rash mood, I joined the Labour Party, but it simply translated into being bombarded with requests for donations and invitations to fund-raisers. Inspiration factor zero for me and I quickly removed myself from all their mailing lists (which took a while). If not Ann Pettifor (and I would ask her, Why not Ann Pettifor?) then who? Whose banner ought we to follow? Jeremy Corbyn? He may well look good in the aftermath of the inevitably train wreck that is Brexit and the collapse of the Tory Party due to infighting, but I don't think he is the revolutionary leader we need. He may well tip the government back towards liberal social policies, but he's not planning to take back control of the monetary system (as far as I know). But at least we have someone who is capable of articulating the vision and who is quite high profile for a left-wing intellectual these days. At least there is a coherent alternative to the Neoliberal gibberish we have been drowning in. At least there are people, like Ann, who are telling us that the status quo is not inevitable and that things can change. She reminded us that in the past things have changed, and that it is people who change them. So at least there is that. The video is now online. Poor sound quality unfortunately.